Michael The Researcher: The World's Oldest Man, Walter Breuning, Turned 113 Today! The World's Oldest Man, Walter Breuning, Turned 113 Today! Walter Breuning was born in 1896 and is still doing very well. There are a few videos of him on youtube if you want to take a look. You will be quite impressed with him - he remembers when his grandfather would talk about his time in the War Between The States and hearing about President William McKinley getting assassinated. Check this out - last month, when Walter was "only" 112, I sent a self-addressed stamped envelope with an enclosed index card to his current address, and in one week I received the index card signed!! 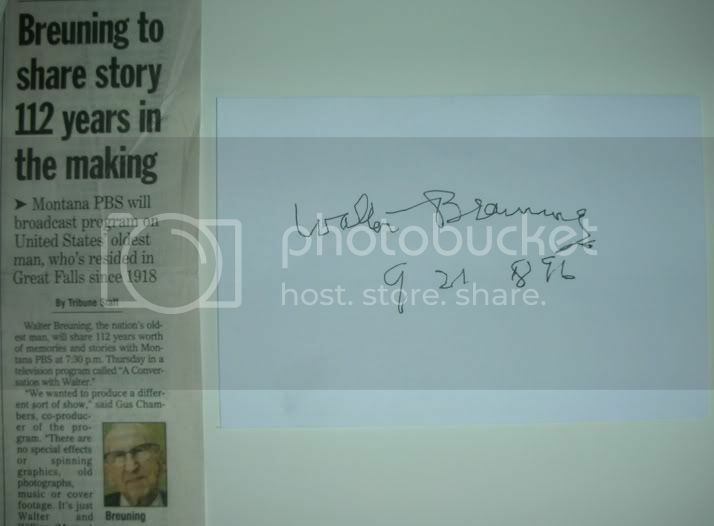 Here is an autograph of the oldest man in the world (with a newspaper clipping)! I go to concerts a lot and meet Rock Stars (some of which are in their 50s and 60s now). If any of them say they are too old to sign, I'll just pull this out and say, "Too old? I got the oldest of them all!! "!